Looking to attract as many buyers as possible when you list your home? Painting is a fairly inexpensive (well, compared to other remodel projects) way to freshen up the look of the exterior and or interior. Now, it may not net you the most amount of dollars in increased home value, but when done well it can help attract more buyers to your listing. There are so many fun ideas out there for colors to use, how to coordinate with the style of the home, ideas on what will bring more interest. Today, I want to talk about some painting fails to avoid. Please tell me I am not the only one who has seen this! You are driving down the street, whether it be to a friend or family’s house, Sunday drive, maybe even on the way home. You are driving along, when suddenly your head snaps back around to see that house, the solitary house, that is brighter than the rest of the homes around it. Not the good kind of bright. More of the if this house were a muppet what kind would it be bright? There is nothing wrong with wanting to stand out. Or liking bright muppet like colors. However, when you want to sell your home, this can be kind of a deterrent. Exterior paint is a bit more expensive to replace, and most buyers prefer to begin with a color they either like or can live with. So when deciding to paint your exterior prior to selling, it is better to err on the side of caution color wise. You can always put in a pop of color with the front door though. One of the most common mistakes I see when walking into a home, is a poor prime job, closely followed by not enough coats of paint. Why is primer important when painting? Many reasons. It helps protect the surface that is being painted, increases the paint’s durability, and it helps the paint adhere better to the surface that is being painted. Unfortunately, sometimes corners are cut and it effects the entire project. People may think that they are saving money by not buying primer, but in many cases it can actually save a person money. When you prime properly, you don’t always need the coat upon coat upon coat of paint that you would use when not using a primer. While you would end up buying two products, you may not end up spending as much on paint as anticipated. Speaking of cutting corners…..Make sure if you are going to paint a room, you paint it all! Now granted, the example picture is of a kitchen, and I am not telling you to pull out your stove or dishwasher to paint behind (although not a horrible idea if you plan on replacing those soon for ones that may be different height). However, it does illustrate my point. People, most notably buyers visiting a home that is for sale, will find those places where corners are cut. Where mistakes are made. Is painting for hours on end fun? Debatable, but I am pretty sure that most of us like to take breaks. Or bribe friends to come help. Say you decide not to paint a space behind your entertainment center, because, hey it is covered up, so who is going to notice anyway? Everyone! Everyone will notice, when you sell your home and that entertainment center is gone. You don’t even have to move for that to happen! My advice is, if you are going to do a project, do it right, and don’t just make a decision that effects the moment, but think of the long term effect as well. It lessens the chances of regrets, and memes on facebook. I saw an example of this last month when showing a client a home! You laugh, but it is true. Sponge paint painting on walls in the home does exist. Why? I wish I could tell you. Perhaps the kids were delegated to paint while mom and dad kicked back. Maybe a person wanted to add some texture. Either way, it is not appealing. It does not make a buyer feel like they could live there, could relax in the room. What they do see, is something half way done, and a project they are going to have to do if they overcome it and make an offer on the home. Please, don’t sponge paint the walls! Save yourself the money and the time, and do it right. Fully paint the wall. Please? 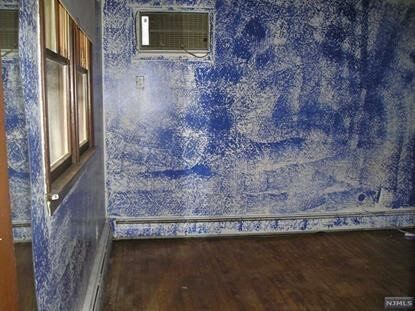 While we are talking sponge paint, I also want to implore you to please not paint a mural on your wall. Not when selling, anyway. If you are staying for a duration, then that is different. I have seen so many murals. Nature scenes, historic scenes. None of which a buyer was impressed with. I can say that they have all been turn offs, but make for good stories. Just don’t make it your story if you want to sell your home. I’m not going to lie, I like a good accent wall. They can make a great piece of art pop, a room feel sleek when done well. Sometimes two different colors mesh, they compliment each other. Four…? May be a little bit much. I look at the picture above, and it reminds me of one those inflatable balls. You know, the ones people bat around in a pool? Or like the colors of a circus big top. Don’t get me wrong, I love color. Vibrant bright colors. However, a different one on every wall in a room? It can be distracting, taking away from the feeling of space in a room as well as cost you more money, as that is four different colors of paint you have to buy. For one room! Think balance when painting a room. Do you know what kind of décor you want to use? What is the function of the room you are in? Is it for activity, relaxing? Search for color and accompanying décor that matches the intent. Sometimes, less is more. Have you or someone you know ever committed one of these painting cardinal sins? If so, please share a picture, and the reaction to the paint!